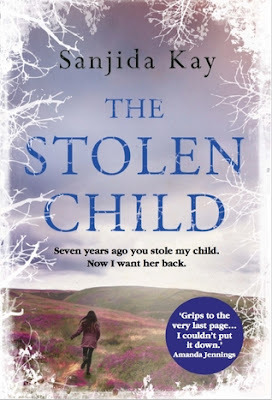 The Stolen Child is the first of Sanjida Kay's novels that I have read. I am gutted that the authors previous novel Bone by Bone somehow bypassed me, because this is SO good. The Stolen Child in question is 7 year old Evie Morley. Adopted at birth by besotted parents Zoe and Ollie Morley who had tried for years to have a child of their own. They are obsessed with their perfect little girl, and think that life couldn't get any better. Until little Ben is naturally conceived. A little miracle of a Brother for Evie. Another child to cherish and shower with love and affection. Evie and Ben are equally loved by the Morley's. But not everyone shares this opinion. Evie begins to receive gifts from an unknown person claiming to be her Birth Father. At first Evie hides this from her parents, thinking that they will take the presents away. Slowly Evie's Father begins to poison her mind against her adoptive parents and Evie begins to misbehave, claiming it doesn't matter what she does because they're not her 'real parents' and Ben is not her 'real brother'. When Zoe discovers that Evie has been on the receiving end of some cards and gifts she is relieved, as it offers an explanation for Evie's sudden and dramatic change of behaviour. Sadly Zoe's relief doesn't last for long, as Evie vanishes after school one day, whilst Zoe is at the hospital with Ben. The school are claiming Evie's Father picked her up, but Zoe knows that isn't true because she was with him at Ben's bedside and asked the teacher to keep an eye on her daughter. At first there seems to be one prime suspect - Evie's 'real' Father. But how on earth could he have tracked them down? Is he really Evie's Father? Or is he just someone who likes to prey on young girls? Zoe and her Family, together with the police must find the answers, and fast. Everyone knows the first 24-48 hours are crucial no matter how many or how few suspects there are. Naturally Zoe and Ollie begin to suspect everyone around them. Just who can they trust? The author has us the reader asking those same questions, and the answer is not always clear. The Stolen Child is a twisty, atmospheric literary thriller that I can't recommend highly enough. The Stolen Child is available from 6 April 2017. You can pre-order it now via lovereading.co.uk. Thank You to lovereading.co.uk and the publishers who sent me an advanced copy of this novel in exchange for an honest review.